The last Ashes, Paper & Beans episode of 2008 . . . Started the show with several poem tracks from a Bruce McRae (Victoria, BC) demo cassette received: "Sum Over Parts", "Grass In My Hair", Tiny Photographs", "Blueprint", and "Tough Luck". The feature, though, was a live guest tonight: performing songwriter Yves St-Laurent of Fredericton and Montreal. The wide-ranging interview included performances of his "The Underwear Song" and the multilingual "Not So Very Far" plus his cover of a Johnny Cash tune: "The L&M Don't Stop Here Any More". Ended with "Palmas" by Luis Rodriguez. 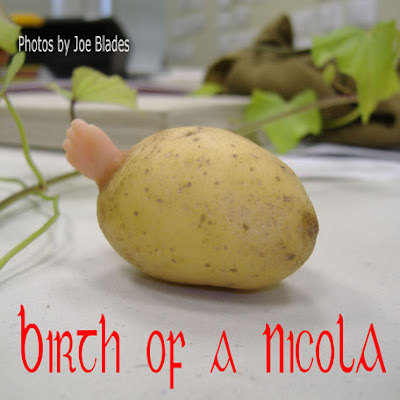 This past Saturday night, on the last day of autumn 2008, we finished filming for Birth of a Nicola, a project of F. Chris Giles. Back in August we built a 12+ foot high, 21 x 24 foot square film set on the floor of the auditorium of the Charlotte Street Arts Centre. 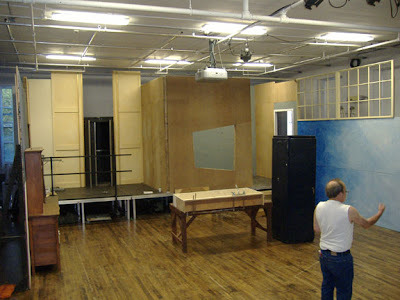 We borrowed stuff—flats, furniture, fake library, a door—from Theatre New Brunswick then added stage risers, steps, ex-Radient Darkroom's revolving door, and more walls build mainly with materials recovered from the restaurant set of the Diplomatic Relations film from earlier this year. Jim Lavoie in the foreground. Scientia (played by BronweN) with potato baby in the kitchen of the set, as seen from the labratory through the window opening. 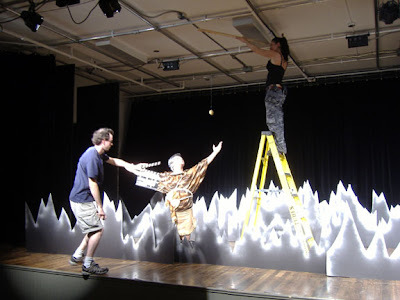 Chief Qzuiliv (played by Dennis Poirier) of the Quecheua peoples high in the mountails of Altiplanu praying and accepting the first potato, come from another dimension, in the starry night. Allan Galloway with the slate; Jessica Holt up on the stepladder. 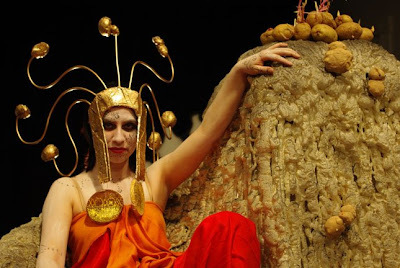 The Potato Goddess (also played by BronweN) on her thone in the underworld. 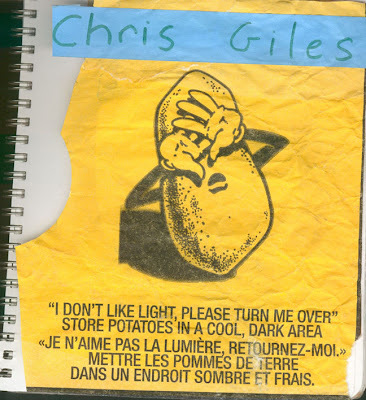 At the Silver Wave Film Festival 2007, Chris Giles was presented with a New Brunswick Joy Award for this project. He is the writer–director–producer. 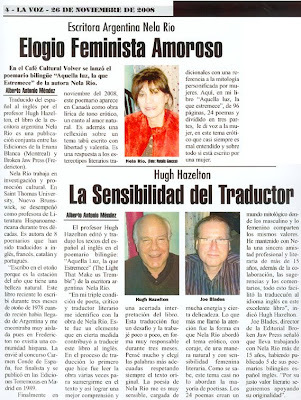 Before the start of our double book launch on 11 november 2008 at Volver café culturel, we (Nela Rio, Hugh Hazelton y Joe Blades) were interviewed by Alberto Antonio Méndez for La Voz. He was assisted by Natalia Gnecco, who took our photographs, and who translated for me. A copy of the La Voz issue arrived in yesterday's post. 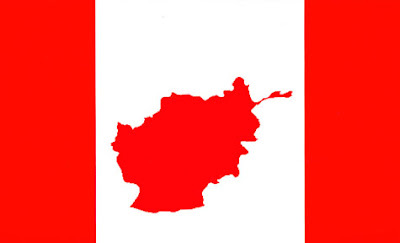 O Kandahar! 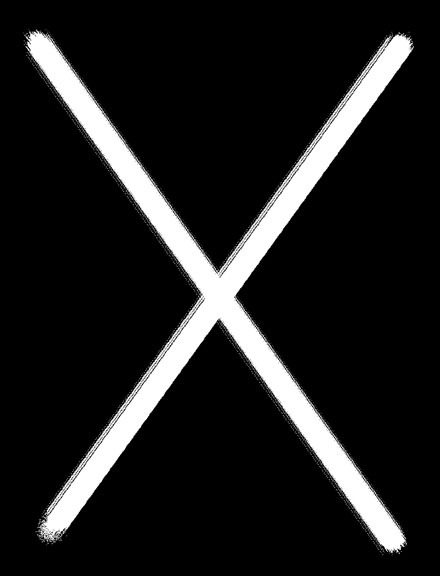 Your home and native land! from a True North far away. We stand on guard for thee? Please make your land glorious and free. O Kandahar, we die on guard of thee. O Kandahar, we’re standing guard on thee. Vince Tinguely feature from the soon-to-be-released CD: I Am Burdened With A Past: Poetry Recordings 1986-2006. From Silver Wave Film Festival 2008 Industry Series: Canada Feature Film Panel-Case Study-Nonsense Revolution (L-R: still from Nonesense Revolution, Ann Verrall (Writer-Director), Thom Fitzgerald (Producer), Doug Pettigrew (Producer). "Sweeper Don't Clean My Street" by Reg E. Gaines. My last living grandparent, my Mom's Mom died early this morning. 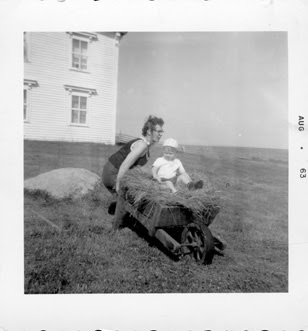 Picture above is of her and me in St George's, Newfoundland just a few years ago . . . when I had my 2nd b'day. The phone call from the nursing centre in Halifax woke my parents and me after midnight . . . though my parents weren't swift to tell me---guess they were waiting until they knew I was awake . . . and I was so awake, waiting upstairs, that I was reading and waiting until I had to trek downstairs for the bathroom . . . after all, why else would their phone ring after midnight? When I saw her this week I could see she was so tiny, the cancer having eaten almost everything. Just her kneecaps raising the still, burgundy-coloured blanket; her head way too close to skull-like, open mouthed from the painkillers. I watched her trying to form dad's name and mine with her near-useless mouth and tongue when she couldn't say anything. So little left of such a solid, firm, and loving woman already less than half her real weight, and so much shorter. I hope I can live up to my obligation to cracking and eating lobsters for her for many, many years to come . 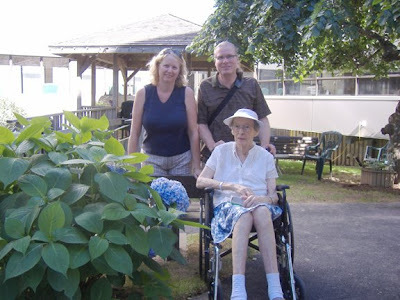 . .
Pic above is from August of this year, Gram now in the wheeled device, with my youngest and younger sister in the courtyard garden at Northwood. Thanks to Ruth's husband, Mike, by brother-in-law, for taking this picture with my camera. The service will be a week Monday in the morning in Dartmouth. What with the back-to-back storms predicted for the next few days (at least one a nor'easter) I came back to Fredericton earlier than planned. My sister, Carol, is expected to fly into Halifax Intl next Saturday. I must travel there again than day, or Sunday, depending upon the weather. "I'm a Stranger Here, Myself" by Cin Salach & Sheila Donahue. "Beat the Drum" by Christopher Stewart. "New Work" (poems) by Marilyn Iwama (photo on right). A Morsel by Paula Belina.